Why is the EPA Sitting on Its Ash? 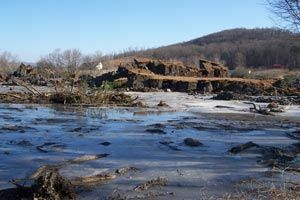 It has been two years since an earthen dike holding back 1.1 billion gallons of coal slurry ruptured, unleashing a tsunami of dark gray sludge from the Tennessee Valley Authority’s Kingston Fossil Plant in Harriman, Tennessee. The wave destroyed homes, surged into the yards of neighbors, and caused the nearby ponds and streams to overflow. More than 300 acres of land were covered in the stuff, and in the weeks after, the ash would travel as far as 30 miles downstream on the nearby Emory River. Locals refer to the "ash bergs" up to 40 feet tall that landed in their yards and floated down the river. The environmental disaster for the first time raised the question of why coal-burning power plants are allowed to dump the fly ash waste—the fine, dust-like particles emitted when coal is burned to create power—into vast open pits. The ash, doused with water and left in these containment ponds for years, contains toxic elements like arsenic, mercury, and lead. But for decades, the disposal of the waste was left unregulated. Power plants produce more than 130 million tons of the ash each year, and while 43 percent of it gets recycled into products like cement and wallboard, much of the rest remains on site at coal-fired power plants around the country. Sarah McCoin, a 55-year-old benefits consultant, lives about a mile and a half from the plant, on a 40-acre horse farm that has been in her family for nine generations. The night the dike burst, she heard the sirens of emergency responders and saw spotlights shining down from aircraft overhead, but didn’t know what happened. The next morning, she heard on the local news that there had been a mudslide, and she found that it had taken out the road leading to her house. But one look at the gray gunk made it clear that this was no ordinary mudslide. McCoin found snapped telephone poles and grim-faced neighbors in the wake of what was later described as a "tidal wave" of slurry. It was enough liquid to fill 1,666 Olympic-size swimming pools. They finally finished dredging ash from the bottom of the river in early December, almost two years after the spill. While residents were first told it would take four weeks to clean up, the estimates now are more like four years. The catastrophe is expected to cost the Tennessee Valley Authority (TVA) up to $1.2 billion, though environmental economists have said the true cost for all the damage—the pollution in the river and the human health problems caused by dumping a billion gallons of toxic sludge into backyards—is likely more than $4 billion. Most of McCoin’s neighbors who were displaced by the spill have settled with the TVA and moved on. McCoin’s farm is just beyond the boundary between homes that the TVA has bought, and she’s not looking to move, anyway, she says. She and others downstream from the spill have filed a number of lawsuits, seeking compensation for the environmental and health hazards of living in an area contaminated with coal ash, which according to studies comes with a cancer risk nine times greater than smoking a pack of cigarettes a day. Just last week there was news of a leak at another containment pond on the site—which the TVA says was just a "small" trickle of rainwater. "I’m not buying it," says McCoin. Which leads, of course, to the bigger question—why are utilities still allowed to dump the waste in these pits? In the wake of the TVA spill, EPA Administrator Lisa Jackson—who wasn’t yet even sworn in at the time—pledged to revisit the question of regulating coal combustion waste. In the months after, EPA identified 431 containment units for coal slurry at 162 sites around the country and has labeled 49 of them "high hazard"—meaning they pose a risk to human health and the environment.